There is crazy and then there is CraZy! I decided at the beginning of 2016 that I was going to try new things. I never imagined this would be the 'new' that I would try! 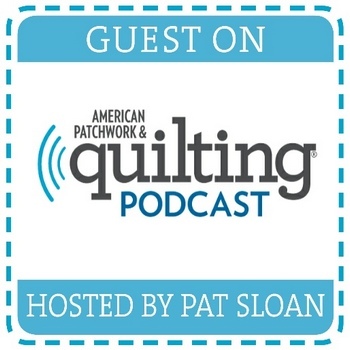 One thing I love about quilting and quilters, nothing is off limits. You are only limit by your imagination. For my second entry in the Blogger's Quilt Festival, I decided to enter ''Raw I' in the MINI QUILT. A mini that packs a punch, hits all the creative notes and for me, something that is totally outside the box! 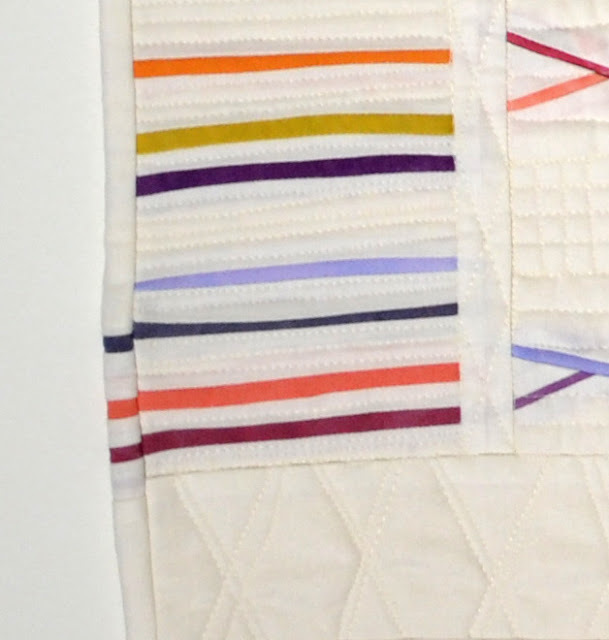 A quilt that makes you question 'how small is too small'! When an idea hits me, I must explore it! Weaving. Specifically Raw Edge Weaving. I've learned not to question where these ideas come from. I roll with the punches and see what happens. The trimmings are 1/4" or less, but I was sure I could weave them. I ended up with 2 1/4" to 2 1/2" blocks that were full of possibilities. After playing, arranging, stitching and fussing, I came up with a design I was proud of! It evolved over a period of time, something that I've come to appreciate and look forward to when working through a design. The matched binding proved to be a little more difficult than I wanted it to be! The lines on the left represent the first step in weaving. Strips. The 'X's became the process of weaving. Interlacing the fabrics together. A loose interpretation, but it is improv after all! There will be a 'Raw II' one day, I have these ideas....Yikes! You can read more about this quilt here: Raw I ~ Beyond Scraps. Borderline CRazY! 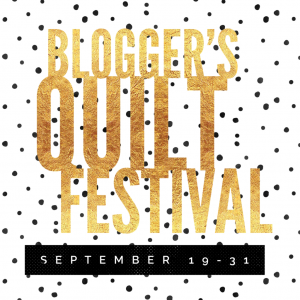 The Blogger's Quilt Festival allows us to share our best! It's like putting on our Easter Dress and Patent Leather shoes! Besides sharing our pride and joy, we get to check out new blogs! There is so much talent it makes my mind spin! We can be a sponge and sop up the inspiration! 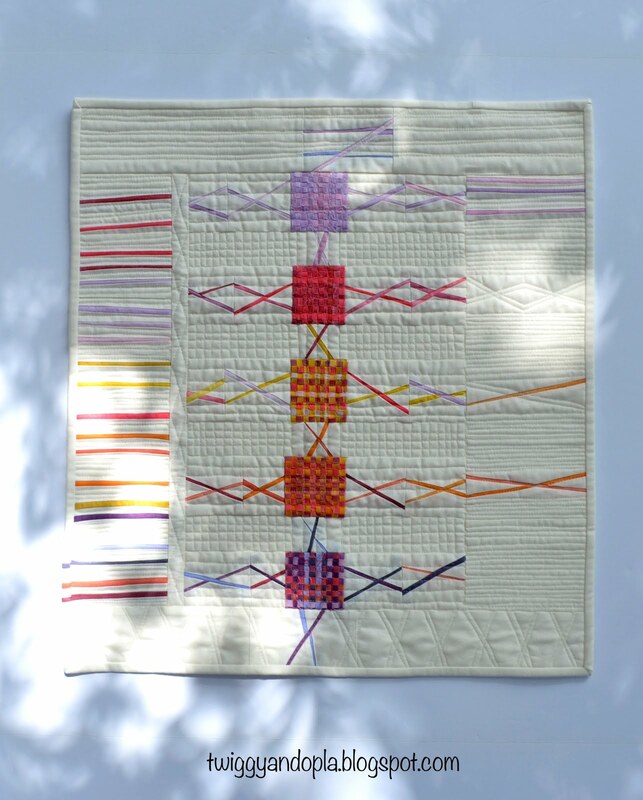 The Blogger's Quilt Festival runs through September 30th. Catch some inspiration, find new blogs...join the fun!! Amy @Amy's Creative Side has hosted this event and as always, it will be another success! This is one of my absolute favorites!! A winner in my book!! This quilt is amazing!! Love it!!! What a wonderful piece made from such small and fidely pieces. Looks stunning. Good luck in the contest. I agree with Peaches up there - you are really coming up with some beautiful, original ideas that I am totally inspired by - and I really enjoy seeing. It's so fun to just explore and play with no real goal in mind - I think that's why you are so successful with your designs. Just keep on keepin' on, Jayne - you are rocking it! You never fail to come up with new ideas and bring them to completion, Jayne. The mini is gorgeous... And I enjoyed reading your interpretation of this beautiful design! I love that you rescued small scraps to weave and that woven in to the mini are more small strips of color. Beautifully done, Jayne! Wow, this turned out great! Beautiful! 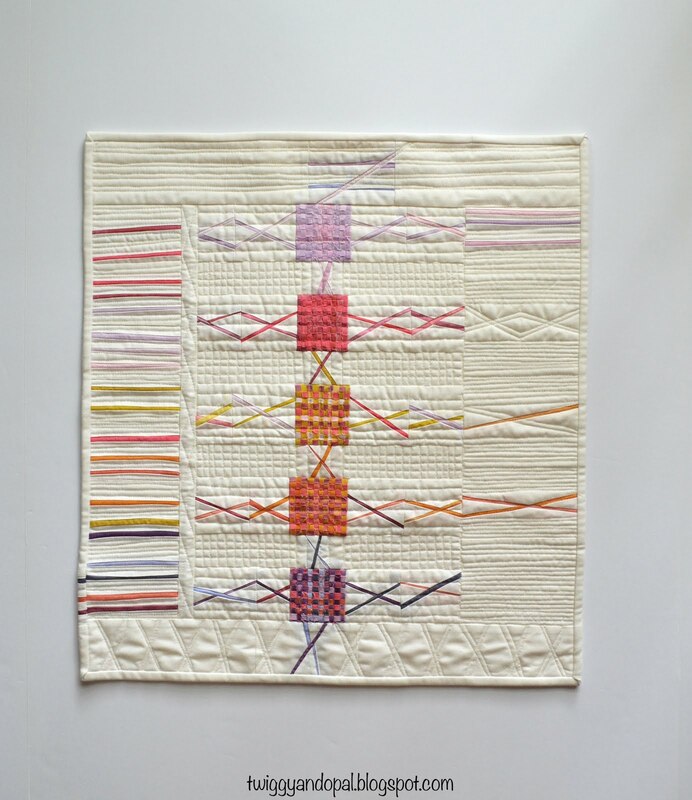 When I see one of your quilts the word that comes to mind most often is 'Inspired'. You have such a wonderful eye for colour and original design. It is beautiful Jayne. So great! Thanks for sharing in the festival! Oh Jayne I just love this quilt!! Ever since I have seen it I feel guilty when I put trimmings like this in the recycle bin - it always makes me think of you!! I am so impressed by the ideas running around in your head! What a fantastic quilt! Great idea. The best one! I am in awe of your inspiration and execution. Brava! 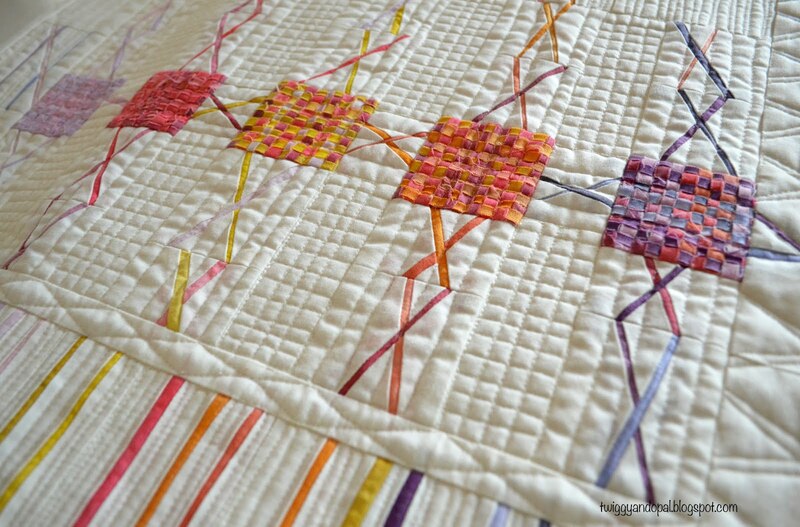 I love it and your ideas and your quilting and ...all :-)!!! I am often inspired by those tiny trimmings as well, but haven't quite got to use pieces that small yet. Beautiful quilt! I'm so happy you are entering this one. I save scraps but not always that small. I absolutely cannot throw away the scraps from hand dyed fabric (or batiks) and so gift them to a friend who does snippit quilts. This one is one of my favorites! It is so far out of the box. Perfect choice for the festival! This one is so innovative! Besides, if you question your sanity during the quit-making process, you're probably growing as an artist. That's my theory, anyway. 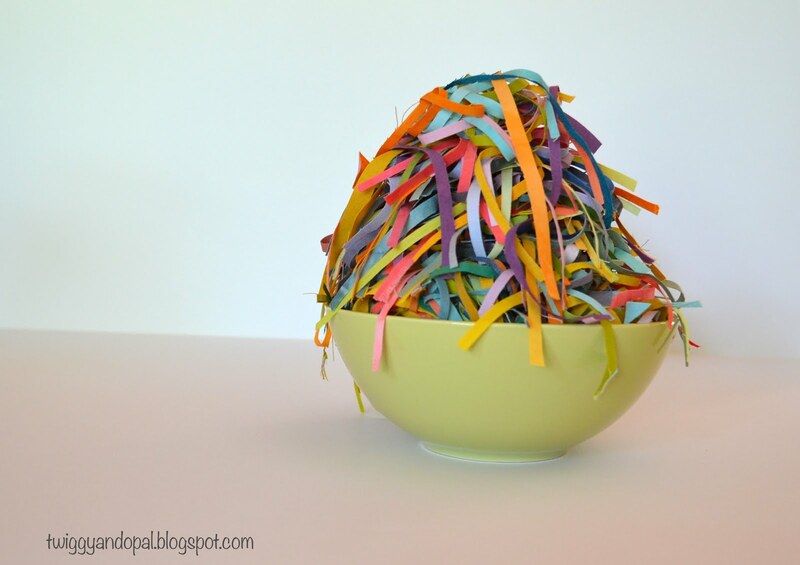 I love your bowl of trimmings; they look like party streamers. Very cool! My favorite picture is the one of the woven squares all by themselves. What an accomplishment in itself! Great entry in the BQF! I have loved this quilt and so happy to see it entered. Wow! That certainly is imaginative, and industrious, too! I love how you made those tiny little strips into something gorgeous! This truly is one of your best Jayne. You killed it Jayne. This is fantastic! I was talking about this very quilt today and telling everyone how fantastic it is. Yes, my favorite and definitely a winner! Wow, this is really cool! I love your unique approach to using those tiny strips. This is amazing! Love it! The woven squares are just perfect, and I love the story it tells of the weaving. This is fantastic! 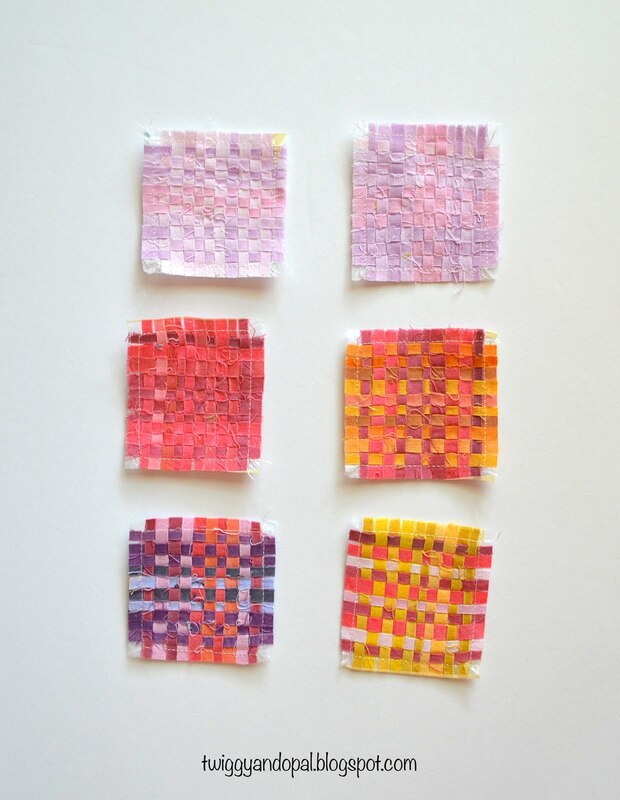 I feel the same way about tiny little pieces of pretty fabrics - don't want to throw them away. Your crazy idea turned out so well - great design and execution! Love the concept of tiny woven strips. Makes for a wonderful mini. The bowl of trimmings is cool too. 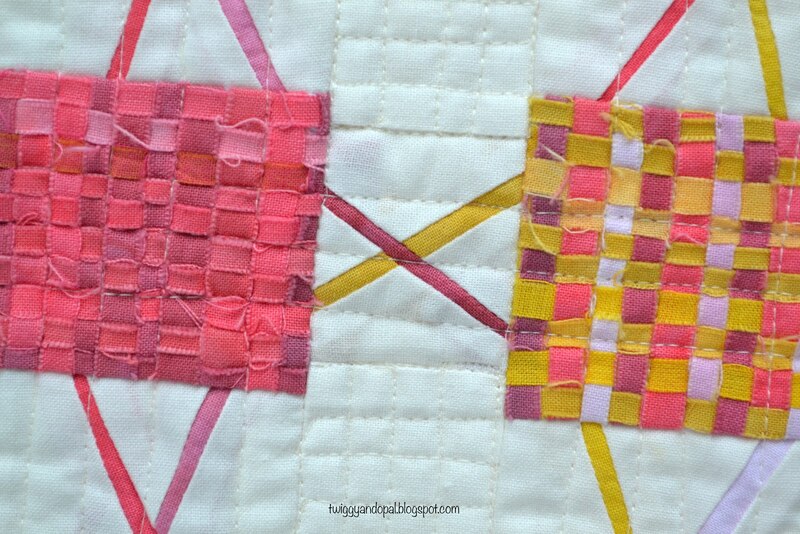 Such a beautiful and intricate mini quilt. Wonderfully original. This is such an intriguing piece- It keeps popping into my head! 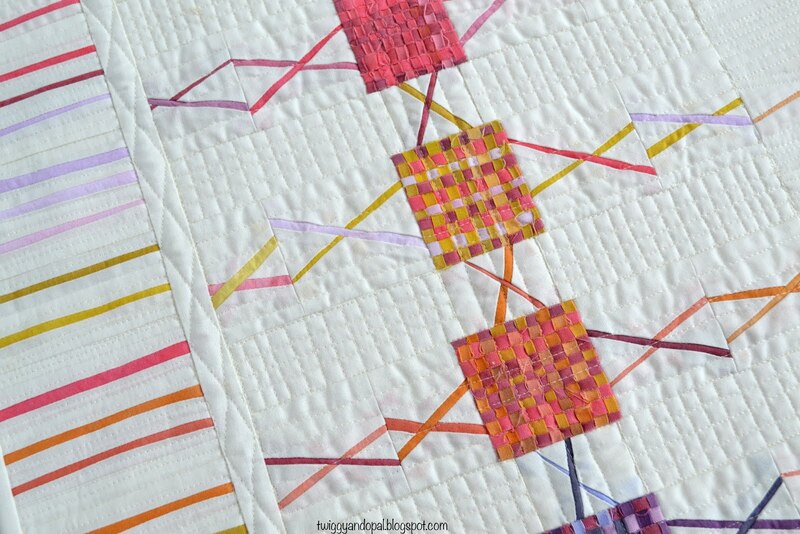 I love your use of texture and small scale piecing. The detail of the stripes on the binding is perfect! The Shape Family Challenge ~ A Pillow!